There is a wide plethora of different panels on the market that can be used to protect our phones. Some of them are designed to mitigate the negative effects of occurring sudden contact with a hard surface under the effects of gravity; others rely on our ineptitude to keep our phones away from moisture so they are constructed in such a way that makes your phone completely water proof; for the cruder members of the readership, there are also all in one solutions and even though they don’t look very elegant, they ensure that your phone becomes almost indestructible. Sadly, most of us don’t like using those special cases, mainly for aesthetic reasons, so we leave our devices to their inherent vulnerabilities, thinking that damage will never happen to us. You never even consider the possibility that you would be one of those people who would drop their handset in the toilet. Or in a puddle. Or in the swimming pool. Who would’ve thought that it’s a bad idea to hang around water while you’re checking your Facebook or tweeting about how nice it is to go for a swim in a hot summer day. Hence, many devices end up being tested under water and, quite naturally, fail the trial by water. But fear not because it’s not all lost. Even when things look quite dire, it’s not impossible to reverse some of the effects H2O has on your previous and expensive toys. 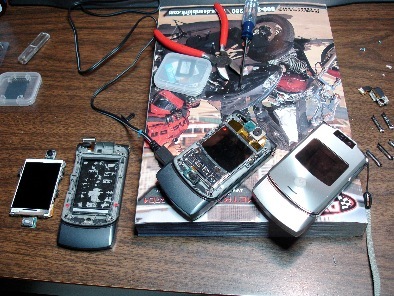 Here’s what you should do in a desperate attempt to revive your phone after it’s been damaged by water. I know it’s easy for me to say this because I’m not the one who will probably have to buy a new phone, but it’s really important not to panic. This is the natural emotional response to the situation, and I do realize that, but if you manage to remain calm, you have a much better chance to save your handset than if you panic and start screaming like a little girl (no offense if you’re little girls; then it’s completely natural but instead of reading this here, go and ask mommy or daddy what to do). So, anyway, it’s really important not to panic so you don’t something stupid like try to dry your phone out with a hair dryer. This is really one of the worst decisions you can make because this way you risk spreading the moisture even further. Don’t try this just because it seems logical and you’ve read it somewhere. If you use a hair dryer, you will basically guarantee that your phone will damaged beyond repair. Remove the battery and the panels of your phone and place them on a towel. Carefully wipe them all off with another towel, trying to absorb as much of the moisture as possible. You need to act quickly. The faster you do this, the bigger the chance of saving your phone is. Wipe everything off and let it sit on the towel for a few hours. At this point, you can try using a vacuum cleaner to such the moisture out but this is optional if you’re feeling optimistic. After a few hours on the towel, assemble your phone and place it a bow full of rice. Rice has a high affinity to water so it will ensure that the remaining moisture is removed from the phone and absorbed by the rice. Rotate the phone every few hours until you go to bed. Say a prayer if you want, because this is truly a â? ?Hail Mary passâ?, but this is optional. Let it sit in the rice for the night and try switching it on in the morning. If it still doesn’t work, you can try consulting a specialist, but I think that at this point it’s fair to say that you need a new phone.